Note: Now you do not need this App. Instagram officially added multiple accounts support. So, you can do this officially. Instagram is one of the most popular photo sharing app. It is popular because of its nice photo effects which you can add to photos before sharing with friends. To use this app, you need to download Instagram and install in your device. But you can only login with one account. So, what if you have a personal account and a business account on Instagram. Bloggers generally face this problem. Because most of the bloggers also use blog’s Instagram account to promote posts. So, how will you open two Instagram accounts simultaneously on your device? I have a perfect solution if you want to try it on your Android device. And good thing is that you do not need to root your device to use this solution. Instwogram is the app which lets you access another Instagram accounts in your smartphone. But this app is against Terms and conditions of Instagram. So, the app is not available on Play Store. You can download it from XDA forums. 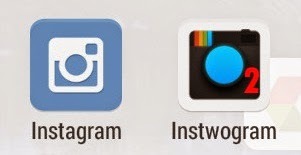 After downloading the APK, install it in your Android device and you will see Instwogram icon in your device. So, you can access different account with this app and your primary account with the Instagram app. To install the apk, you have to enable app to install from unknown source. For this, go to Settings> Security> Unknown Sources and check the appropriate box. The latest stable release of the app lets you post photos and videos using Instwogram. You can also follow other people and browse other accounts. This app runs on a device running Android 2.2 or higher. This app also offers two add-ons if you want to have the download feature within the app. But that is only for geeky users. Because you will have to root your device to install the add-ons in your device. If you can root your device, you can go ahead and install add-ons to add download feature.